Alcoholic Off. Joe Landers accidentally gets his partner killed and clumsily tries to cover it up as Stone and Keller work their way to the truth. ***SPOILERS*** It was hard working family man Robert Graves', Robert Drives, misfortune to be stopped for a minor traffic violation by the drunk & psycho cop Off. Joe Landers, Leslie Nielsen, who's handling of the next to nothing affair, running a red light, turned to the shooting of his partner Off. Mel Shaffer, Jock Mahoney. After having himself juiced up with cheap booze, the only kind that he can afford, Landers doing his best "Dirty Harry" imitation manhandled the startled Graves and in the process his gun which he had drawn went off hitting Shaffer killing him. Knowing the fix that he's gotten himself into Landers makes up a story that the innocent Graves disarmed him and used his service revolver to kill Shaffer instead. But with Graves still alive as well as two witnesses to the fatal shooting Landers knows unless he kills or murders Graves, so he can't testify to his innocence in court, his goose is cooked along with his career as well as freedom. With an all points bulletin out for accused "Cop Killer" Graves Landers more then willingly, even though nobody asked him,joins in on the chase to not apprehended Graves but murder him in order he not end up implicating him in his partners, Shaffer, "Frindely Fire" shooting death. It's Det. Let. 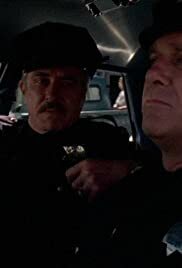 Mike Stone, Karl Malden, who with his bloodhound like nose who smells a rat in all this in Graves being a cop killer and starts to check or sniff out Landers' over the top attempt to catch Shaffer's killer. That soon leads him to a number of ginmill and liquor stores that Laders visited while both on and off duty that contributed to his both alcoholism as well as paranoia. This has Det. Let. Stone sniff his way to San Francisco's skid row where Landers now a fugitive from the law in his attempted murder of not only Let. Det. Stone but his partner Steve Keller, Michael Douglas, and Landers' late partner's son Officer Corky Shaffer, Ric Corrott. ***SPOILERS*** Despite what problems Landers had, his wife left him five years ago, he had no excuse for his actions even if they, as he tried to convince himself, were alcohol induced. The man was sick and needed help but to my surprise the police treated him with kid gloves until he finally went off the handle and started shooting everything and everyone in sight. As for the totally innocent Frank Graves even when it was obvious that Landers shot Shaffer not him he was put in the lock-up and kept isolated from his pregnant wife Helen, Susan Stasberg, until the very end of the TV episode.